While staying at the Duck-In, you’ll be able to experience unique waterfront living just minutes from Seattle. You'll have 100 feet of beautiful Lake Washington shoreline right outside your front door. Enjoy scenic panoramic views of the lake (and peekaboo views of Mt. Rainier on a clear day) within the cozy comforts of the cottage by taking it all in through its large living room and dining room windows. During the summer you can relax in the large park-like yard while watching all the activity on the water. The Duck-In is a perfect place for small families, couples, or for buisness travelers; anyone desiring a beautiful and tranquil setting near the greater Seattle area. Conveniently located between downtown Seattle and Bellevue, both featuring major tourist and shopping attractions, the Duck-In is just a few minutes commute either way. And it's only 20 minutes from Seatac International Airport. 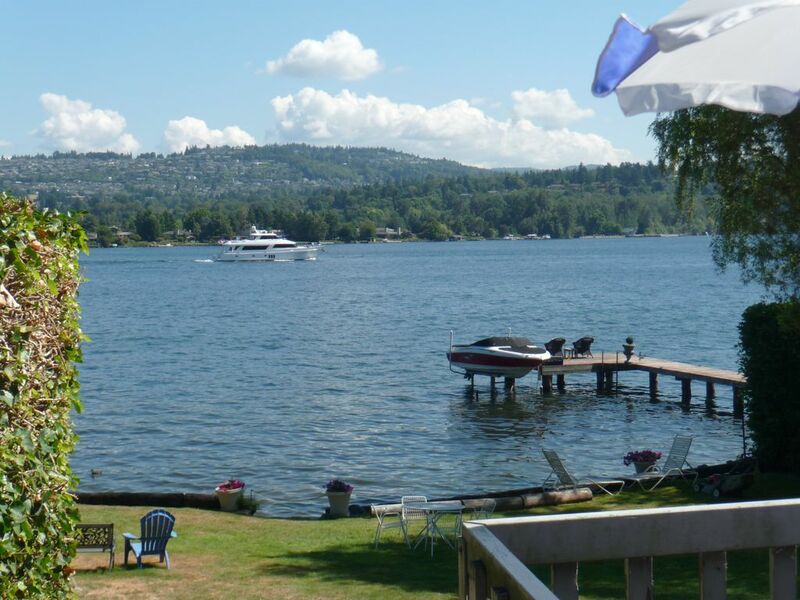 The Duck-In is a one story, fully furnished cottage on beautiful Lake Washington. The cottage is one of the original houses built on Mercer Island, and has been lovingly preserved by the same family for three generations (the owners live right next door). The master bedroom has a queen-size bed and the second bedroom features two twin beds. A single hide-a-bed in the study area can be made available for sleeping if needed. The living room and dining area both feature a panoramic view of the large front yard and lake. The cozy living room has a TV (Cable, DVD and VCR), a comfortable couch with pull-out footrests, and two rocking swivel chairs. Lots of DVD’s are provided for your entertainment. The cottage has a fully equipped kitchen allowing you the choice of either eating out at one of the many great restaurants nearby, or going to the local grocery store so you can cook a meal for yourself. The Duck-In also has a small study room with a desk. It has a full bathroom with sink, toilet and shower/tub. Kitchen cookware, utensils and staples are provided. Upon your arrival, we'll have the kitchen freshly stocked for you with coffee and a fresh baked goodie. What an amazing find. The cottage is what it is...a cottage, but had everything we needed for our stay. The view of the lake each morning was breathtaking as the sun came in the window inviting you to stay. It was the perfect place to stay while going in and out of Seattle. The welcoming scones and coffee were so appreciated since we arrived very late the night before. Ruth’s directions were perfect to find the cottage, even in the dark. I would definitely recommend and look forward to a return visit. Thank you Ruth! We had a wonderful time. Enjoyed the house, very comfortable and the views are terrific. Have absolutely no complaints. One suggestion, the kitchen faucet needs an aerator. Hopefully, coming again next year for the Mercer Island Half marathon and would love to stay at the Duck-In again. Loved all the duck décor, very charming. I thought he access to the property would be a problem but my large 1 ton Ram had no problems. Once you're there you immediately realize what a special place it is. Except for a few more towels and maybe a bigger bbq grill, it seemed well equiped. I'd have no problem staying there again. If you want peace and quiet, a step back in time and a great location, the Duck Inn is a must. The muffins and a cupboard and refrigerator filled with condiments and spices made it feel like home. It's furnished just like you Grandma's house. The owners are great. Very quaint and serene. Would stay there again any time I had business in Seattle. Beats any hotel. Great quite little place. Very old school like staying with your grandparents back in the 70’s. Could use a bigger TV but other than that I have no complaints. What a great spot. Loved staying here.